Source: DT Labs/Bio-Protective Products, Inc.
DT Labs/Bio-Protective Products, Inc. Mitt allows for the clean-up of industrial spills and has a bonded sorbent that absorbs most aqueous solutions, oils and chemicals. Suitable for the clean-up of small aqueous, oil or non-threatening chemical spills, this mitt can be used more than once. 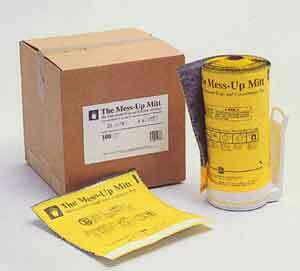 It is also available on a roll of 25 perforated invertible wipe and containment bags for small industrial spills.